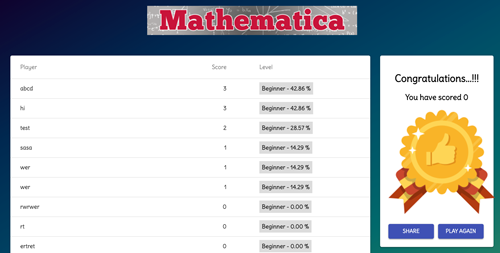 Mathematica Challenge is interactive algebraic expression game where you have to enter answers for falling challenges. Show your mathematical skills over challenging time. Each player will be categorized in to 3 groups according to their performance on challenge set. This game brings general mathematical expressions such as numeric expressions, trigonometric expressions, factorials, logarithms etc. You can also skip or miss 3 challenges. Your goal is to score as much as you can with your analytical thinking speed!. Also you will be able to share your results on Facebook to invite others to take the challenge. 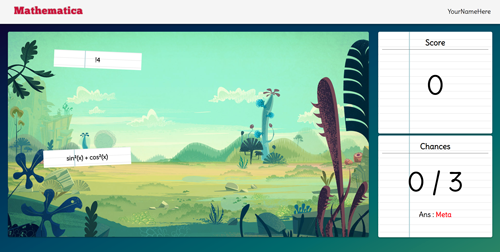 After you Logged In you will get an screen like this. Some Mathematical Expression will fall down from the top of the screen. You have to calculate these expressions and answer correctly. In the right side of the screen you will see your score and number of chances you have. For each attempt you will get 3 chances. That mean you can miss maximally 3 expressions. After you finished all the challanges or after the time out you will see the leader board. I suggest that you use a different character for "multiply" - 5x-12 looks like a single variable expression. Some labels close to the right edge were partially hidden. Nice! 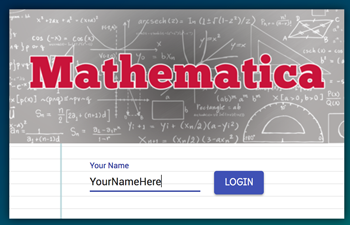 Challenging math problems, polished interface, excellent scoreboard. It would be awesome if the problems were a little randomized for replay value. Awesome. I enjoyed on playing it. Quite fun, if frustrating! It's been a while since calculus, so I don't remember how all the functions work, and it was definitely tricky getting all the answers typed quickly enough to get the points! It would be cool to have a slow scale up in difficulty, and perhaps more randomized challenges. Perhaps also an option to either slow down or skip some of the equations to give yourself a few moments to think of the answer. the game is fun, but there's a lot of room for improvement. 1. (5x 5^2) X 4 = 500, but it accepts 1000 as the answer. 2. It arbitrarily ends at level 31, even though user have lives, I see some folks at level 36, how does one get there? 3. It should get harder or faster as one progresses through the levels, right now one can get very easy entry even on 25+, It could be a deliberate design decision but, hardening or fastening will fix the problem where you have a level that no human can reach.